In 1884, the hamlet of Ancrum was established here in what is now the Municipality of Riverdale. Later, an Anglican church and community hall were built nearby. It was hoped, on arrival of the Great North West Central Railway (later purchased by the Canadian Pacific Railway) in 1902, that a train station would be built. Instead, the station was built at Bradwardine where some of Ancrum’s buildings were relocated. The Ancrum church and manse remained until after the end of the Second World War. The Ancrum Anglican Cemetery, located one mile north, remains in use. The original Ancrum School building was destroyed by fire in April 1905. Rebuilt that same year, the school closed in 1915 and its students went to Bradwardine Consolidated School No. 1307. The school building was moved to Bradwardine where it became a private residence and, in 1957, to a farm at NE12-12-23W. 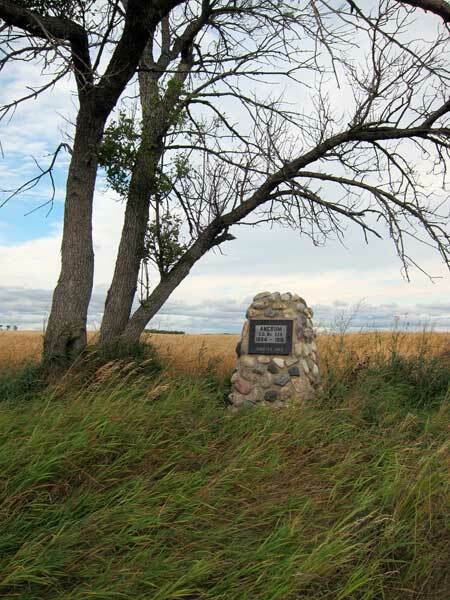 A stone monument at the former school site was erected in October 1983. Among the teachers who worked at Ancrum School through the years were Miss Cameron, Mrs. Hayes, Ruby Donald, Helen Lee, Belle McTavish, Ethel Doherty, Elsie Ivens, M. M. Wark, Amanda Shields, and Alex Wright. “School site marked,” Rivers Gazette Reporter, 18 October 1983, page 8. This page was prepared by Keith Maitland and Gordon Goldsborough.